Ok now because of you I need Essie Sag Harbour. I cant get my head round the Eyeko packaging so cant bring myself to buy one, it screams cheap at me! Still want Lady Muck too! Lady Muck looks prettiest here. Liked June Bug’s look too. There ain’t no 2011 in Barielle-ville. “Rain” is a great polish – as are most Eyeko. Have had June Bug for yonks. Too scared to try it as everyone says it is thick and unworkable. Ohh ohhh, Now I neeeeeeeeeed Essie Sag Habour and Eyeko Rain AND Butter London lady Much, I LOVE them three!!! I love #4 Victoriana!hmm might have to purchase it very soon! Ooooooh I’m in love with Victoriana! So deep and sparkly and oooooh! I absolutely love Eyeko Rain, it’s such a great “moody blue”. It reminds me of when I was younger and I’d make “fake nails” out of blue tack! Not so keen on June Bug, it looks like random specks of red glitter on blue, not for me, at all. 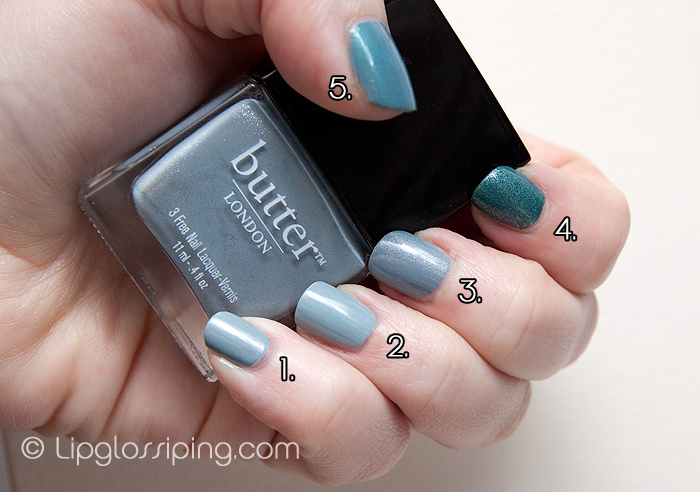 The two Butter London ones here are gorgeous too! I’m definitely a fan of “moody blue” nails, strange, because I can’t usually stand blue nails! Ooh! Loving Victoriana. I don’t have enough fingers for all the goodies I want to buy! Victoriana is my favourite out of all of them!